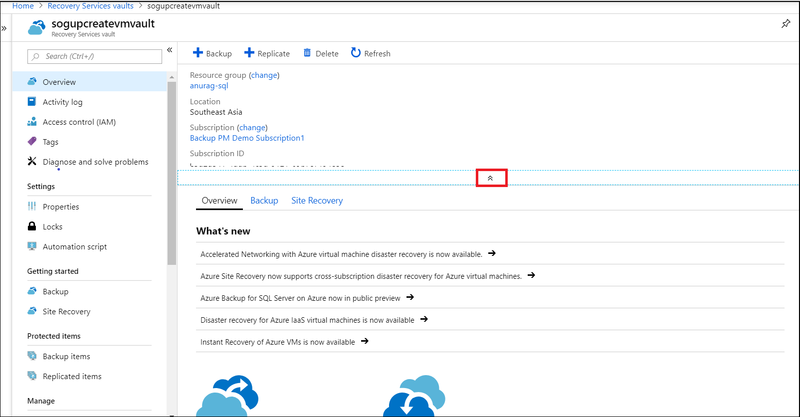 This article explains how to move a Recovery Services vault configured for Azure Backup across Azure subscriptions, or to another resource group in the same subscription. You can use the Azure portal or PowerShell to move a Recovery Services vault. Resource move for Recovery Services vault is supported in Australia East, Australia South East, Canada Central, Canada East, South East Asia, East Asia, Central US, North Central US, East US, East US2, South central US, West Central US, West Central US2, West US, Central India, South India, Japan East, Japan West, Korea Central, Korea South, North Europe, West Europe, South Africa North, South Africa West, UK South, UK West, UAE Central, and UAE North. During vault move across resource groups, both the source and target resource groups are locked preventing the write and delete operations. For more information, see this article. Only admin subscription has the permissions to move a vault. For moving vault across subscriptions, the target subscription must reside in the same tenant as the source subscription and its state should be enabled. You must have permission to perform write operations on the target resource group. Moving the vault only changes the resource group. The Recovery Services vault will reside on the same location and it cannot be changed. You can move only one Recovery Services vault, per region, at a time. If a VM doesn’t move with the Recovery Services vault across subscriptions, or to a new resource group, the current VM recovery points will remain intact in the vault until they expire. Whether the VM is moved with the vault or not, you can always restore the VM from the retained backup history in the vault. The Azure Disk Encryption requires that the key vault and VMs reside in the same Azure region and subscription. To move a virtual machine with managed disks, see this article. The options for moving resources deployed through the Classic model differ depending on whether you are moving the resources within a subscription, or to a new subscription. For more information, see this article. Backup policies defined for the vault are retained after the vault moves across subscriptions or to a new resource group. Moving vault with the Azure Files, Azure File Sync, or SQL in IaaS VMs across subscriptions and resource groups is not supported. If you move a vault containing VM backup data, across subscriptions, you must move your VMs to the same subscription, and use the same target resource group to continue backups. 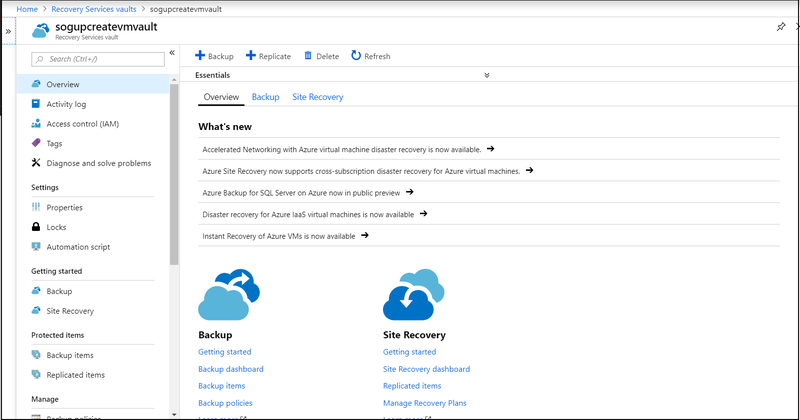 Recovery Services vaults configured to use with Azure Site Recovery can’t move, yet. If you have configured any VMs (Azure IaaS, Hyper-V, VMware) or physical machines for disaster recovery using the Azure Site Recovery, the move operation will be blocked. The resource move feature for Site Recovery service is not yet available. Open the list of Recovery Services vaults and select the vault you want to move. When the vault dashboard opens, it appears as shown in the following image. If you do not see the Essentials information for your vault, click the drop-down icon. You should now see the Essentials information for your vault. In the vault overview menu, click change next to the Resource group, to open the Move resources blade. In the Move resources blade, for the selected vault it is recommended to move the optional related resources by selecting the checkbox as shown in the following image. To add the target resource group, in the Resource group drop-down list select an existing resource group or click create a new group option. After adding the resource group, confirm I understand that tools and scripts associated with moved resources will not work until I update them to use new resource IDs option and then click OK to complete moving the vault. Open the list of Recovery Services vaults and select the vault you want to move. When the vault dashboard opens, it appears as shown the following image. In the vault overview menu, click change next to Subscription, to open the Move resources blade. Select the resources to be moved, here we recommend you to use the Select All option to select all the listed optional resources. Select the target subscription from the Subscription drop-down list, where you want the vault to be moved. Click I understand that tools and scripts associated with moved resources will not work until I update them to use new resource IDs option to confirm, and then click OK.
Cross subscription backup (RS vault and protected VMs are in different subscriptions) is not a supported scenario. Also, storage redundancy option from local redundant storage (LRS) to global redundant storage (GRS) and vice versa cannot be modified during the vault move operation. To move a Recovery Services vault to another resource group, use the Move-AzureRMResource cmdlet. Move-AzureRMResource requires the resource name and type of resource. You can get both from the Get-AzureRmRecoveryServicesVault cmdlet. To move the resources to different subscription, include the -DestinationSubscriptionId parameter. After executing the above cmdlets, you will be asked to confirm that you want to move the specified resources. Type Y to confirm. After a successful validation, the resource moves. You need to set/verify the access controls for the resource groups. The Backup reporting and monitoring feature needs to be configured again for the vault post the move completes. The previous configuration will be lost during the move operation. You can move many different types of resources between resource groups and subscriptions.